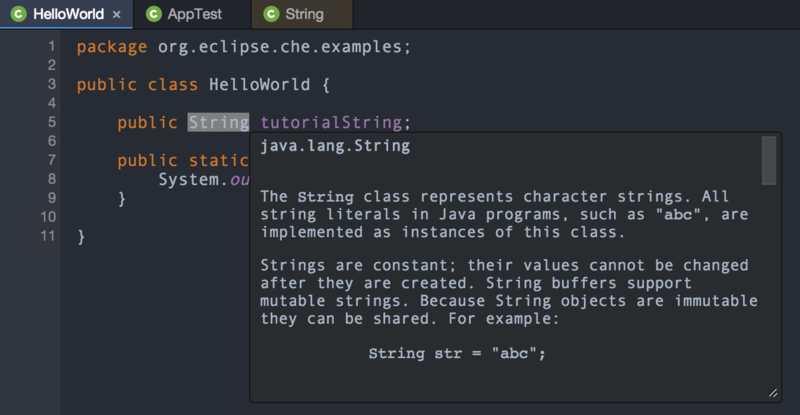 Eclipse Che was written in Java. 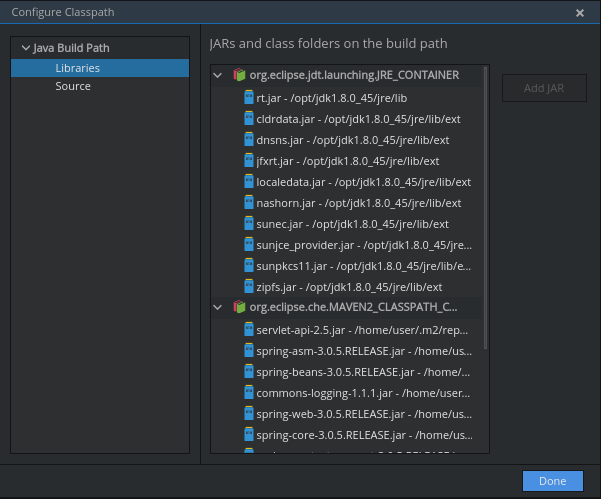 Get started with the rich Intellisense and Java tools in this tutorial from Tyler Jewell. 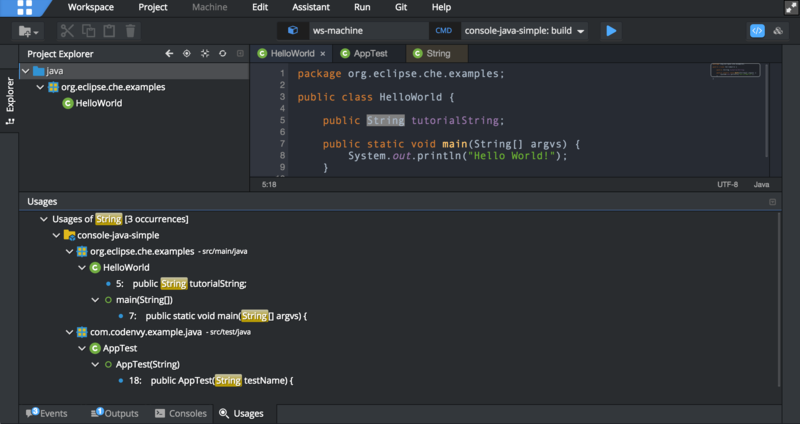 Eclipse Che was written in Java. Get started with the rich Intellisense and Java tools in this tutorial. When you execute this command, you'll see the URL for the user dashboard. The Che dashboard will open. It is where you manage your projects and workspaces. If you do not have any projects in Che, you'll be asked to create a new project. If you already have projects in Che, click on the New Projectbutton in the menu bar. 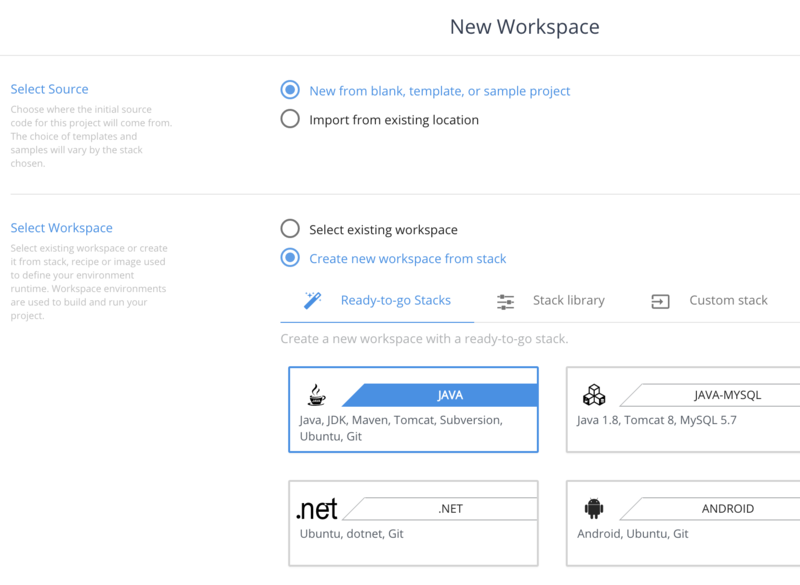 From the Dashboard page, click Create Workspace. This informs Che where the source code for your project is going to come from. It is possible to start a new blank, template, sample project or import one from another location. Choosing the first option will present you with a set of samples that are preconfigured. If you already have a project with a valid URL, choose the second option. Che gives you choices on how to source the project from Git, GitHub, ZIP, etc. We will create a project from a provided template. Ready-To-Go Stacks. Environments that have a large variety of tools already installed optimized for projects of a particular type. For this example, we will select the Java stack which will create a container with Ubuntu git, java-jdk, Maven, Tomcat installed. Stack Library. Offers finer-grained stacks that can be used to create specific technology layers needed for a project. Ubuntu and Debian stacks, for example, are minimal stacks with only an operating system and Che tools installed. Custom Stack. You can provide your own custom stack. You'll have the ability to upload a recipe (Dockerfile) or directly edit it from there. Choose the Ready-To-Go category and select the JAVA stack. Provide a name to your workspace and configure its RAM. RAM will be the memory limit applied to the machines running your workspace environment. For this tutorial, create a new workspace with name tutorial-java and set its RAM to 1GB. Ready-to-run project samples. These samples have a compilable source tree and embedded commands. The list of templates available is filtered based upon the stack chosen. Wizard-driven project configuration. 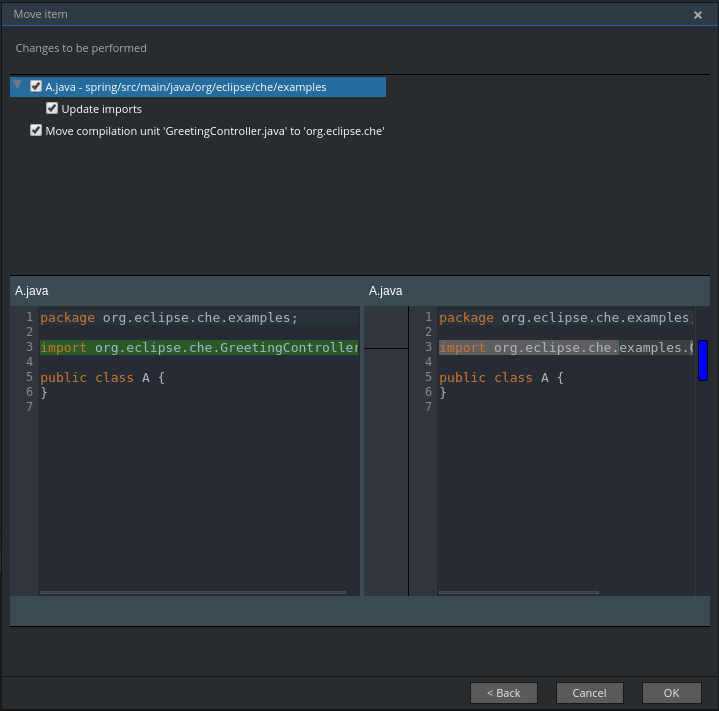 This creates a blank project and then opens the IDE's project configuration wizard to let you scaffold a new project based upon a set of configurable parameters. This option is only available if there an appropriate project type available for the stack chosen. Choose Ready-to-run project samples and select console-java-simple, those options should be preselected by default. You can set a name and description of your project. 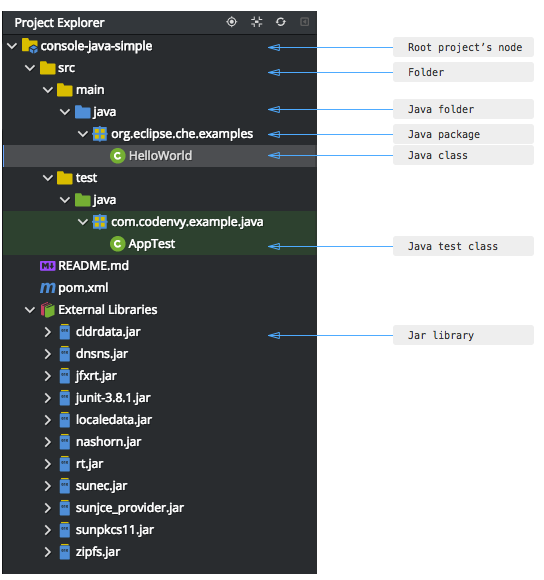 The name is what will appear as the root node in the project explorer in the IDE. Keep the default values. Hit the button Create at the bottom of the flow. The project construction will start. The project construction process goes through a number of steps including creating a new workspace, downloading an image to use for the workspace environment, instantiating that environment, installing Che services into the workspace, and then creating your project. The project created is a Maven project. Once you open it in the IDE, you'll see the dependencies updated from the pom.xml file. enter to open a file. 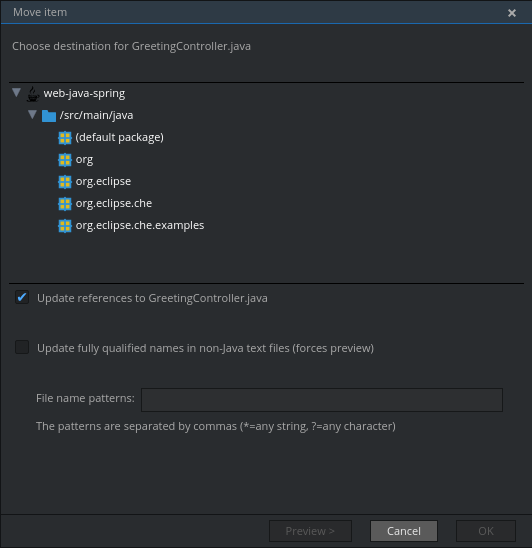 Open the file HelloWorld.java in the package org.eclipse.che.examples. The file is displayed with syntax coloration. You can use your keyboard to navigate in the file content, but also between files. You can get the complete list of all keyboard shortcut by going into the menu Assistant > Key Bindings and scrolling to the category Editor. There is an Assistant menu that includes language specific capabilities. You can perform auto-complete by hittingctrl-space. While you are editing your Java code, you may want a documentation lookup for a particular symbol (class, attribute or method). Get quick documentation by Assistant > Quick Documentation or ^j. If you need more information about the symbol, you can also navigate to its definition with Assistant > Open Declaration or F4. The String class will open in a new editor. Che editor provides various ways to search your projects and workspace. 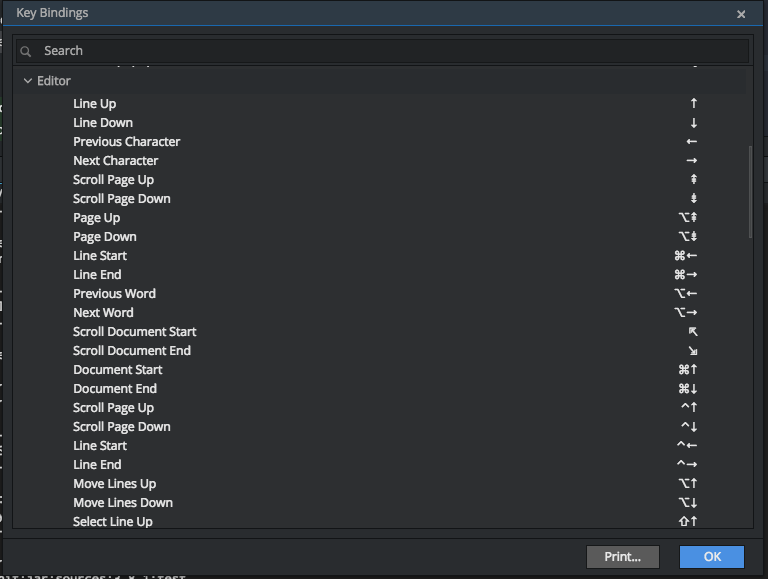 Use the editor search to find and replace in a particular file via CTRL+f keyboard shortcut. You can also use regular expressions. This will find all references of a particular class, method, field, or attribute and search for its usage in your various project's files. Do this with Assistant > Find Usages. 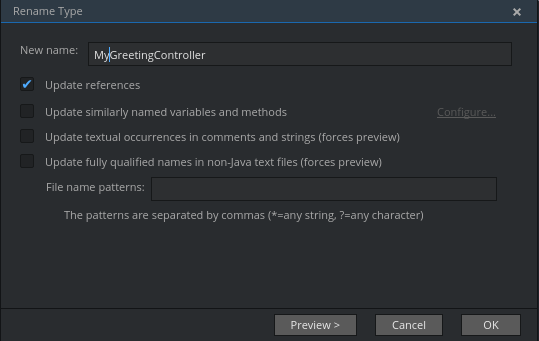 A new panel will open and list all references for String into your project. If you select one of the occurrence and double click on it, the editor will open the file to the position of the found reference. 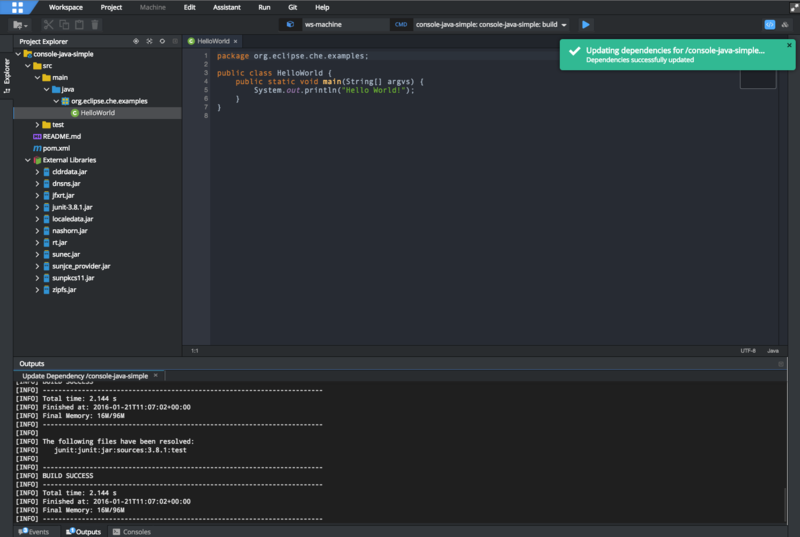 Che provides the ability to refactor your source code. Put your cursor on the method, variable, or field that you want to rename and hit Shift + F6. If this hotkey is pressed once, the selected keyword will be highlighted which means it's ready for refactoring. You can type a new name and press Enter. The preview button will open a side-by-side comparison window that will show changes that you are about to apply. Choose any Java class you want to move and hit F6. It will call a Move item menu. Choose the destination for your class and click OK. It's also possible to preview changes. Choose the destination for your class and click Preview. It will show all Java classes and non-Java files (optional), that the replaced class is referenced in. Maven Plugin provides the ability to manage Maven modules in multi-module projects entirely through pom.xml. As a result, it will be automatically configured as a Maven module in your project tree. Maven plugin watches changes in pom.xml and automatically imports changes (dependencies, configuration etc). If you make changes to dependencies in POM, they will be automatically updated. You can also manually reimport the project: right click on your Maven project, choose Maven > Reimport. There is also a possibility to display POM that results from the application of interpolation, inheritance and active profiles. Just open your Maven project and go to Assistant > Generate Effective Pom. It will open an effective POM with all project dependencies, plugins, plugins configurations up to the root dependencies. Hello OpenJ9 on Windows, I Didn’t Expect You so Soon!